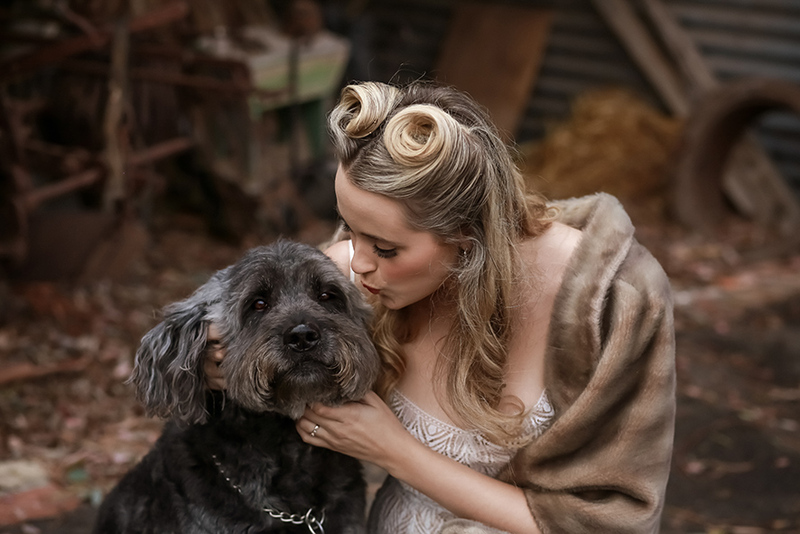 Softly styled pin up blended with ethereal glamour inspired by screen siren and singer Dorothy Lamour is the vision for this alternative post war, late 40s, early 50s wedding shoot. 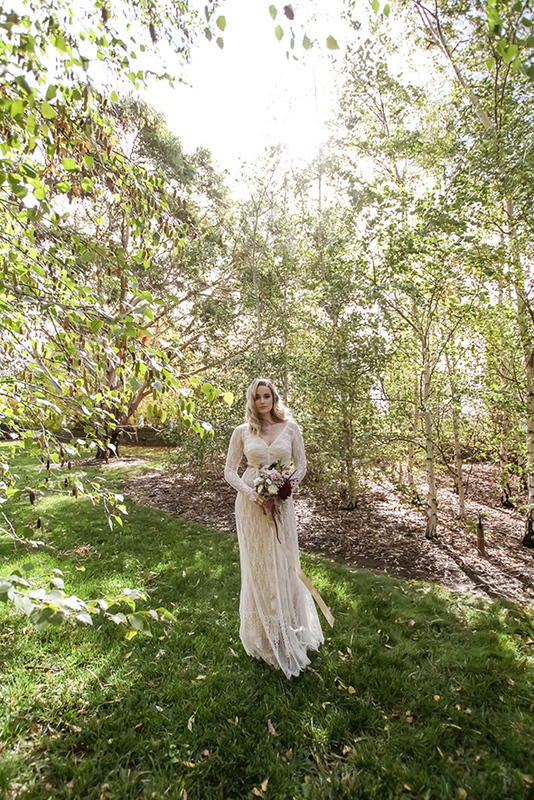 A fresh new romantic bridal look realized by a group of Melbourne's wedding icons and newcomer; the charming Orchards at Spring Vale Farm of which this styled autumn shoot is the first ever at their picturesque location. Victoria’s newest, exclusive wedding venue boasts a beautiful bluestone 1860s homestead, a stunning glass atrium and French doors opening onto a magnificent tiled verandah. Surrounded by gardens, a dam and orchard after orchard the property is the ideal wedding venue. Intoxicatingly warm hosts Linette and Marilyn have created a wondrous experience in this unique regional location just 15 minutes from Ballarat with accommodation for up to ten people. The farm offers a plethora of backdrops. 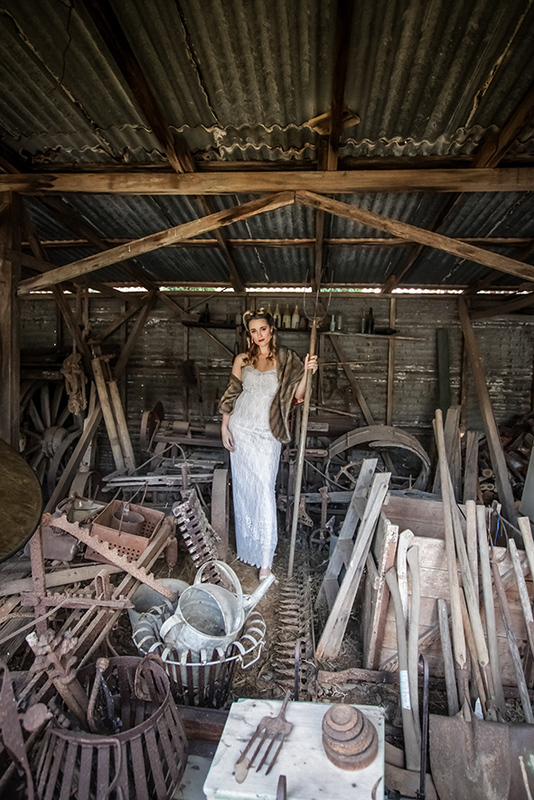 The team could have shot for weeks amongst the, autumn leaves, lichen trees, birch forest, berry encrusted trees, grand verandahs, bluestone, mossy stonewalls and ridiculously photogenic shed filled with rustic farm equipment. Skilled at finding the perfect light and moment. Megan Aldridge approached the shoot with her signature subtle and natural approach. With soft gentle poses and nature's golden light she tells the story of this siren frolicking about an abundant country setting. Hair and Make up artist Vivian Ashworth is massive fan and highly skilled in glamour looks. She chose to keep the look dramatic yet soft and modern with an emphasis on the eyes using colours “Golden Kiss” and “Toffee Shine”. For the lips she chose Vintage red Man Trap plus just a hint of contouring using Superstar liquid highlighter. All cosmetics are from cruelty free, luxury brand Gorgeous Cosmetics. Returning to the Hollywood vamp look of the 50s cat eye she used black liquid eyeliner and lashes by PETA certified Vegan and Cruelty free Model Rock. Deconstructed Victory Rolls referencing the 40s styling with a gentle softness make what could look too done very contemporary & exquisitely flattering as it frames the face and elongates the silhouette. 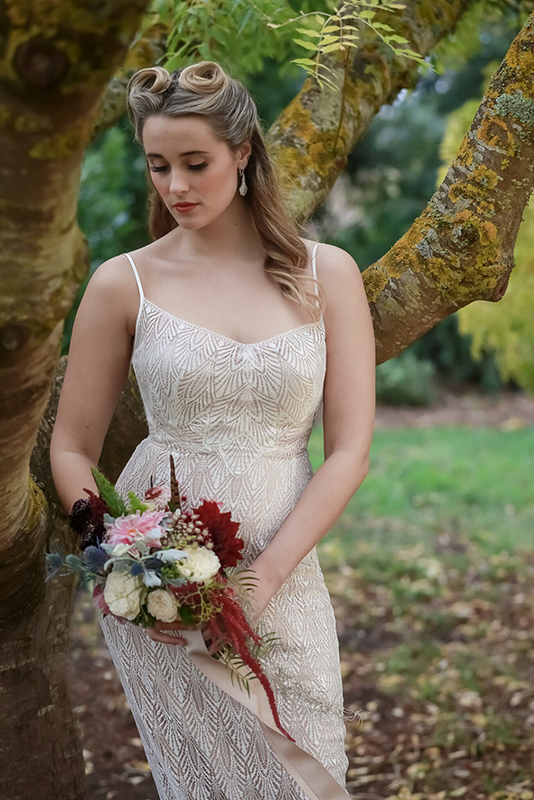 Gwendolynne’s French Lace detailed gowns from her Gwendolynne White Range are effortlessly elegant and timeless in their vintage signature style. Dramatic sleeves designed with skimming fluid silhouettes flatter the female form yet are incredibly comfortable. Skin tone silk under layers allow the intricate lace of the gowns to pop, allowing the look to have dimension and creating a uniquely classic effect. Gwendolynne crafts gowns in any size intimately with her clientele and is celebrating 21 years in business as of July 2018. Vintage faux fur, a rose gold leather belt from Alexi Freeman and earrings from Stephanie Browne and Samantha Wills complete the vision. Each look is subtle in it’s styling with just a couple of accessories. With the venue slowly turning golden for autumn the team also wanted show brides can look beautiful even in as the weather turns, so styling looks for rain and chill are also included. The team agree Autumn is magical wedding season as the leaves break into a sunset of colour plus it’s a time when the madness of summer subsides so a wedding can be the full focus for yourself and guests. Either an intricately hand embroidered veil billowing in the wind or a high glamour birdcage veil close to the face Richard Nylon’s precious veils frame the face or create ethereal halos around the silhouette. There is nothing more breathtaking than a veil for the full effect of a bride and we are seeing a return to the veil after years of the flower crown. The bouquet created by Thrive Flowers was a replica of one of Gwendolynne’s cherished real brides. It has enormous personality like the incredible woman it was designed for. Combining an unexpected cocktail of florals to a theme of “forest wonderland” it includes; David Austin Roses, Queen annes lace, thistles, dahlia’s, hanging amaranths, tillandsia & dusty miller. Gorgeous petite flowers in fireworks arrangement, wavy edged grey foliage and spiky cascading elements create a textural feast. Finished with feathers and puffs of red fluffy spots, the punchy colours, mass of varieties and levels to the arrangement add drama and elongate the silhouette of a bride. 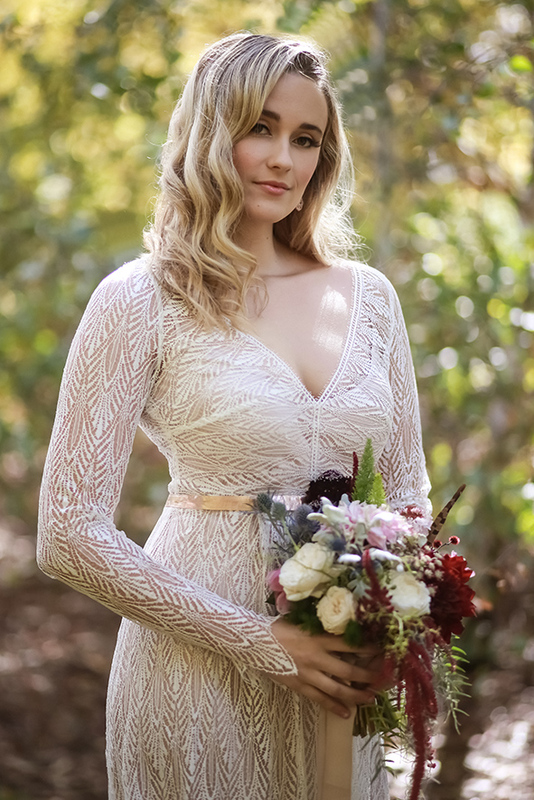 The team felt brand new face; curve model Georgia reflected the perfect wholesome healthy contemporary bride the team regularly sees when they work with real brides. We know Georgia will be one to look out as a positive role model for girls with her exquisite healthy figure and vibrant beaming personality. And of course introducing the charming Orchard resident Duncan the Poodle. Who couldn’t love this furry fellow?